Today I will be reviewing another whitening soap. If you are curious why I’m so into effective whitening soaps you can click here. Anyway, the soap I’m reviewing this time is Lumine Turmeric Soap with Lemon. I first encountered turmeric in high school while watching A Crazy Little Thing Called Love. There was a scene in the movie wherein helped by her three friends, Nam follows the advice of the guidebook Nine Recipes of Love. Part of the advice is whitening her skin and her friends scrubbed a yellow paste on her arms. I got curious and found out it was curcumin, another term for turmeric. There were videos on YouTube about turmeric and yogurt paste and copied the exact step by step process. Once a week I make a paste out of turmeric powder and yogurt then spend 30 mins at the bathroom. I have to put the paste on my entire body 10 mins. Wait for it to dry 10 mins. Then wash it all off 10 mins. ● The process is too tedious and not to mention messy. Doing it all over my body seems like forever. ● It can leave some yellow patches on the skin if you don’t thoroughly wash it off. This can be a problem when you’re on the go. Back then, I wished someone will actually invent a soap out of turmeric. Then after a decade comes, Lumine Turmeric Soap with Lemon. 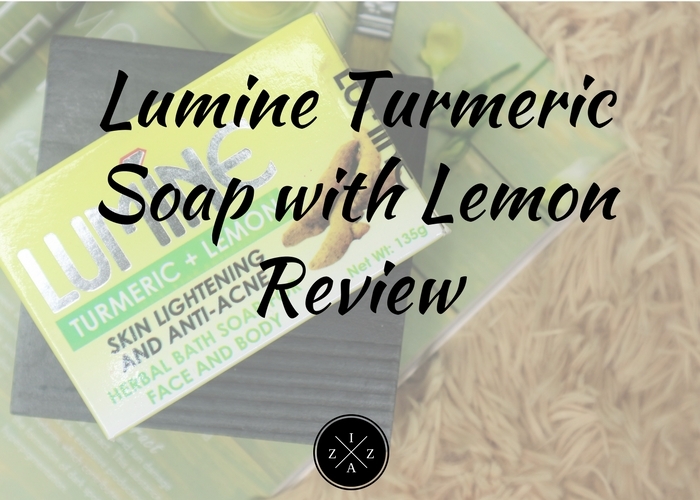 Before I continue with my review on Lumine Turmeric Soap with Lemon, let us first discuss the two key ingredients that make this soap effective! Lumine Turmeric Soap with Lemon has a rich blend of anti-oxidant and helps detoxify the skin. It is a simple way to prevent pigmentation, dark spots, wrinkles and acne for clear, clean and even toned skin. Available for Php 60 for 135 grams. The first thing I noticed about the Lumine Turmeric Soap with Lemon is the scent. It has an addicting scent in to it that will make you fall in love every use. It doesn’t smell like Turmeric or Lemon at all. It has an elegant scent, that’s far from what you will expect based on its packaging. I’ve been using this Lumine Turmeric Soap with Lemon for about three months now. I discovered it early December while shopping for supplies and toiletries. The words Turmeric and Lemon caught my attention for both are known to be key ingredients when it comes to whitening the skin. I work up on a rich lather and apply it to the face like a mask. Afterwards, I put some of the Lumine Turmeric Soap with Lemon on my KyusokuBihaku scrub and exfoliate all over my body. I try to wait for 30 seconds before rinsing so that the key ingredients will sink in to my skin well. Since this soap is an all-natural one, It’s not as foamy compared to other soaps I’ve used like Maxipeel Exfoliant Soap. The feel of the soap reminds me of CY Gabriel instead. And just like CY Gabriel in Special Pink, this Lumine Turmeric Soap with Lemon has a tendency na mahiyang ka. I noticed that after I finished two soaps, the effect became less noticeable. Although it did whiten my skin and gave me that brighter complexion. The combination of turmeric and lemon is indeed effective in my experience. It’s a slow process but something sure. Currently, I’m on my fourth soap already. Lumine is an International & PH accredited, Halal certified, GMP and Dermatologically tested soaps that naturally makes our skin more youthful, vibrant, smooth and white! Manufactured by CJB Manufacturing. A glycerin based soap made of special ingredients that often work by minimizing the production of melanin in your skin and exfoliate the top layers of your skin to reveal the healthier and whiten version of your skin. It helps lighten skin pigmentation, scars and other skin blemishes. This also works as an effective anti-acne treatment because as it exfoliates, it unclogs pores and relieves inflammation caused by acne. It contains Calamansi extract, which has a high amount of alpha hydroxyl acids that act as an astringent, skin lightener and deodorant as it gets rid of skin pigmentation especially the underarm and inner thighs. It contains carrot extracts.Its carotene derivative acts as a free radical scavenger and an anti-oxidant. It is in rich in beta-carotene, Vitamins B, C and E. It improves the complexion by removing toxic build-up in the skin stimulating collagen formation, healing wounds and normalizing sun damage. It fights off signs of early aging, making the skin look glow, young, supple and smooth. It is gentle and safe to use for kids and adults alike. It works by limiting the production of melanin which gives people that tanned color if they are exposed to the sun for long periods. This also helps if you have dark spots, freckles, age spots, or other hyper pigmentation tissues. It helps exfoliate dead skin cells without drying the skin, leaving the skin supple, smooth and fairer. It also soothes sensitive skin, and moisturizes dry skin. Glutathione works by limiting the production of melanin which gives people that tanned color if they are exposed to the sun for long periods. By minimizing melanin, you gradually get fairer skin. This also helps if you have dark spots, freckles, age spots, or other hyper pigmentation issues. Benefits of Papaya Glutathione Combination Soap related alternative medicine supplements and vitamins. It has the highest and purest ingredients that whitens skin as it helps removes spots, blackheads and other skin blemishes. It made with a combination of natural skin lightening fruit acid that work by softening the skin and creating a luminous, healthy glow. It is primarily an exfoliating skin product that slowly gets rid of pigmentation and dark spots by buffing away the damaged skin cells. The Kojic acid soaps help to break down the top layer of skin cells and peel away damaged skin, revealing the fresh and healthy cells underneath. This soap is used by many Japanese men and women as part of their regular facial regimen so that the skin stays soft and vibrant. Kojic acid also has antibacterial and anti-fungal properties. It contains Lemon extracts which helps prevent moisture loss and increase skin elasticity, giving you a younger, healthier and radiant looking skin. Aside from skin whitening and beauty care it can also be used as a health care regimen. Lemon extract is good for one’s complexion since it contains enzymes which help remove dead skin cells. It has astringent properties, hence can be used to bleach and whiten the skin. An additional effect of Lemon is that its aroma helps to uplift your spirit and calm your nerves, helping you feel comfortable. It can also help smoothen skin, keep it moisturized, and control skin oiliness. It can also be used as deodorants for the armpits and feet. Lemon is really a versatile beauty product. A good cleansing soap with natural oatmeal kernels that serves as body scrub and honey that acts as skin moisturizer. It suppresses the "need to scratch," which is especially useful for use on irritated, dry skin. Conditions include insect bites; acne; eczema; psoriasis; sunburn; sores; chicken pox; poison ivy, oak or sumac; shingles; prickly heat; and other itching, tingly rashes. A natural skin whitener. It contains papaya enzymes and extract that is well known for its powerful lightening effect to blemished skin. It also helps prevent early aging signs like wrinkles. Its powerful exfoliating properties that render it beneficial for removing dead skin cells and rejuvenating dry and flaky skin. . Regular use will give the skin a radiant glow look because of its bleaching effect. Its anti-wrinkle and whitening effect. It prevents further wrinkle formation and lightens pigmentation and dark spots. Try this feel and feel the immediate effects. It contains safe ingredients that will effectively relieve your sweating, underarm darkness, and ELIMINATE BAD ODOR when use regularly. If you are looking for a new soap to try I highly suggest this Lumine Turmeric Soap with Lemon. This is the only brand from Lumine that you can buy on Watsons and other department stores.